Representation plays a key role in the conception and realization of any idea. While each individual may have a process in which they work through a thought, their minds are organized by different networks defined by modes. Rather than continue to develop current methods as a means of reaching towards a "projectile" (Carpo + Cache) instead it would prove more effective to develop an alternative Mode of operation. Mode : /mōd/ noun : a way or manner in which something occurs or is experienced, expressed, or done. This concept will also include the manner in which thought, translation and interaction occurs. Above are some early experiments (Spring of 2018) into how a user can begin to break from tradition and translate concepts of how a diagram is made, used and interpreted into a realm of 4+ dimensions with current technologies. 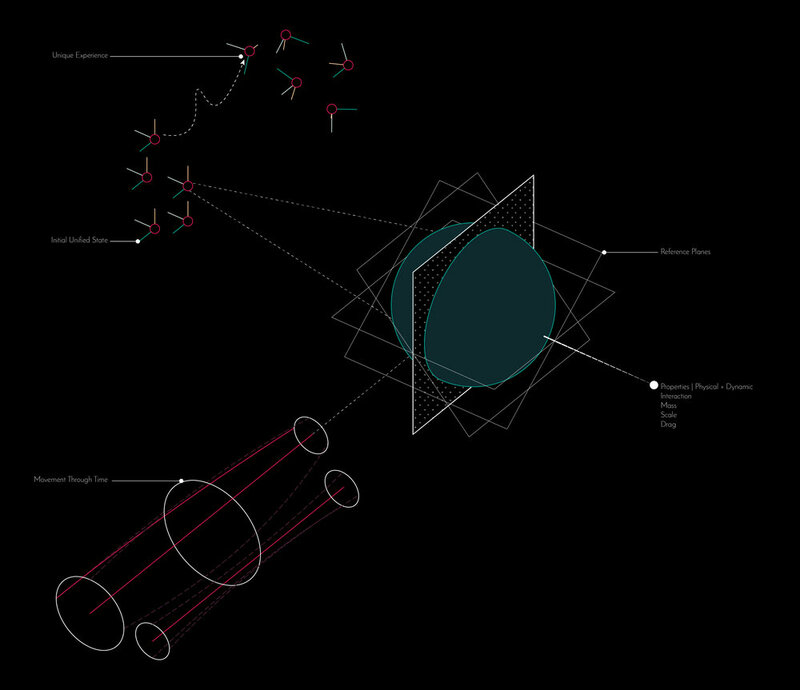 This particular set of experiments [series 0 & 2] works towards breaking down the parameters of a performative element in order to understand how one may utilize such virtual behavioral conditions as one may use lines [their parameters being color, line weight, type, etc] in a traditional diagrammatic context. Keep in mind the projected mode may only be attainable once current interfaces and peripherals have significantly evolved or been abandoned. These early experiments attempt an incremental translation towards an alternative way of working and thinking. Below is an early fantastical projection of what future environments of working may look like. This environment is not one of defined reality or location, but instead open to interpretation. Perhaps virtually occupied and mentally linked for synchronized expression and thought. Is it hyper-informed, abstract, real? While a fantastical approach for this visualization was intended, future projections will explore all these comments in hopes of providing a more convincing and immersive preview into what the future may hold. Below are some isolated and frozen experiments. While freezing them appeals to a somewhat backwards mindset, in these early stages they help with the identification of behaviors and structures. Feel free to explore them here, or on Sketchfab.